Do you ever just crave cornbread? 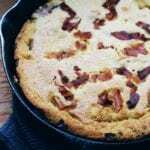 When you try this pancetta cornbread (pane di mais con pancetta), you will soon start to crave it. I wish I could say it was something you try once and you could live without for a while because it was too rich or too spicy or too something. This is one of those breads that you will want to make not just for a holiday. The funny thing is, I usually think of cornbread when I think of Thanksgiving. Mostly because cornbread is one of my favorite things to make for the big holiday. I also like to make cornbread just so I can make homemade cornbread stuffing, and then I can overindulge on one of my favorite parts of the meal, and it’s truly just my fault! A little info on the word mais: both mais and granturco mean corn in Italian. 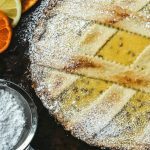 This isn’t a typical cornbread you will find in Italy, but it is one that I have impressed my Italian family with! 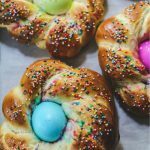 My mother-in-law loves the texture and how how easy it is to whip up! She would most likely make something yeasted like this cornmeal bread. It’s been an insanely busy time here with the kids and some family in town. My daughter celebrated her confirmation, and it was a very big thing for our family. The confirmation was almost like celebrating a baptism or a communion. It is all about the party afterward and being with family and enjoying lots of incredible food! It almost seems like yesterday when I had my confirmation and I remember when I had to choose my sponsor. I chose the daughter of some Sicilian friends of our family. She was an obvious choice as my sponsor and she was only a few years older than me. 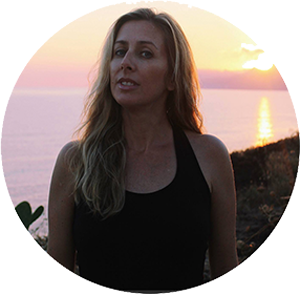 I really wasn’t sure what I was supposed to be thinking about in choosing my sponsor, but since the majority of my cousins and aunts were in Sicily, it was much easier to have her be a part of my big day. Choosing her also made my dad happy, since she was the daughter of his cummare and cumpare. Have you ever heard those words before? I heard them quite a few times last night at another confirmation party of our Italian friends and it brought back so many memories. Cummare and cumpare is Sicilian for madrina and padrino (godmother and godfather). I’ve heard that comare in Napoletano means gossip. But I also know my Calabrian mother-in-law calls great friends or even a close cousin a comare. Since our friends that were celebrating last night were from Rhode Island, they were pronouncing it like “goombadda” and “goommadda”. I had a brief conversation with the mother of the goombadda of this confirmation (you really don’t call the sponsor the godmother, but it was an affectionate way to refer to her during the evening). So the mother of the goombadda was telling me she was Italian, but rather, Sicilian. She told me she came over when she was two years old. I asked her if she speaks Italian, not wanting to insult her, because you never know when you find out that someone was born in Italy and came over as a child, they may still speak the language and then will proudly say, “OF COURSE I speak Italian.” But this was the first time I ever met someone that came over from Sicily (she had to be no more than 60 years old)and she told me they only spoke dialect at home. She said they never spoke Italian and they only spoke in Sicilian. I find it fascinating that they kept the dialect going in their new country. I knew many Sicilian families growing up and the kids could understand their parents discussions, but usually could only respond in a few words here and there. The children of most of our Italian friends could not speak the language at all. My dad never spoke to me in Sicilian, and instead spoke to me in Italian. He left all his siblings behind in Sicily and he only sometimes would be around his Sicilian friends at a party or special dinner. So I didn’t grow up exposed to Sicilian all the time (except when visiting or living in Sicily) like this lady I met last night, and instead I learned Italian. She was only 2 when she came over, but Sicilian was the main language spoken at home. Luckily I can say I can get by with Sicilian and wish I knew even more of this unique dialect. 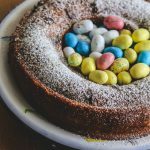 This cornbread is so easy to put together and as I mentioned earlier, there is no need to save it just for Thanksgiving! If you don’t have a cast iron pan, you could use your oven proof skillet or bake it in a deep dish pie plate or a square baking pan. And if you don’t have any pancetta around or don’t feel like buying it, bacon is absolutely fine to use in this recipe. Just remember, it may not be used as a part of the meal. The cornbread may become the meal once everyone takes a bite of it and sees how delicious it is!! 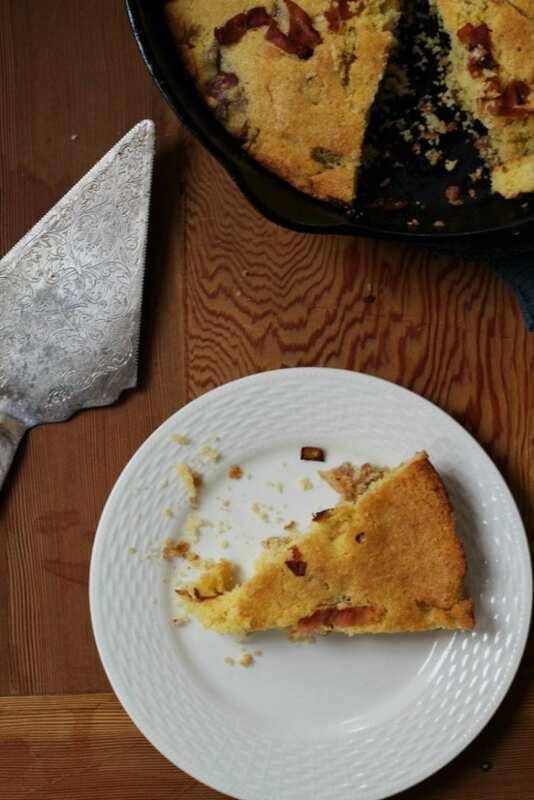 You may also love Heather’s sweet brown butter cornbread and grandmother’s buttermilk cornbread (not my grandmother, but a great recipe!). If you’re looking for something baked with cornmeal that’s amazing, you have to try this savory corn rolls. 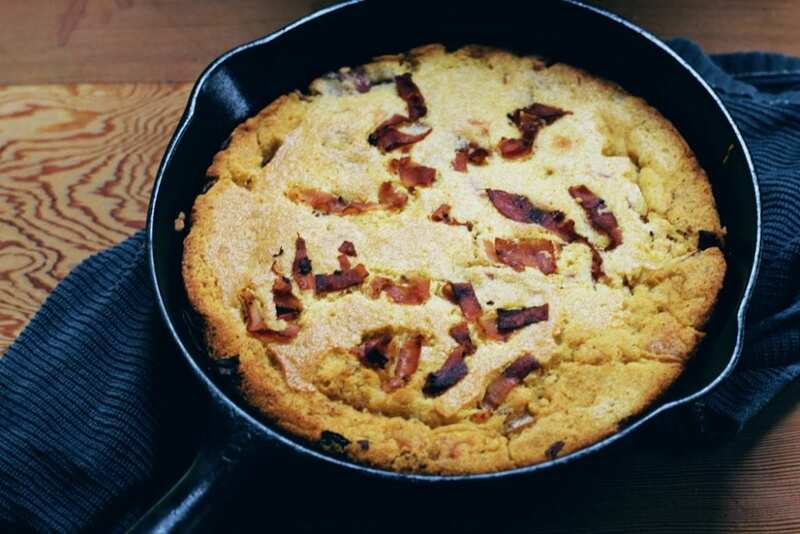 Try our Pancetta Cornbread this holiday. 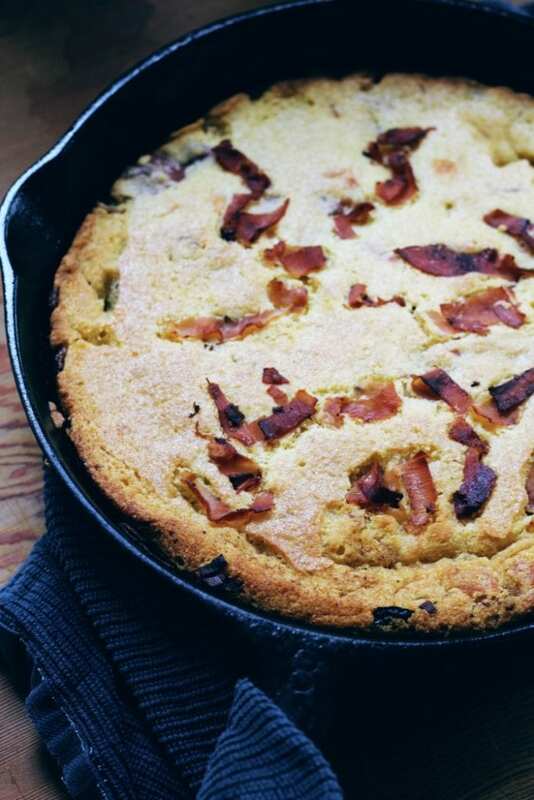 Our all-time favorite cornbread recipe from scratch made even better with the addition of delicious pancetta. 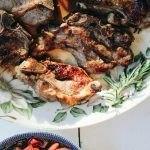 So easy to make and it goes great with any meal. Preheat oven to 400° F. Place an 8 to 10-inch cast-iron skillet in the oven. Heat a small frying pan over a medium heat. Add a tablespoon of butter and melt. Add the onions and saute until softened, about 2 minutes. Saute for another 3 minutes, until the pancetta is very lightly browned. Turn off the heat and set aside. In a small saucepan, bring 3/4 cups of water to a boil. Remove from heat and pour in 1/2 cup of the cornmeal. Stir rapidly until you have a warm mush. In a medium bowl, blend the remaining corn meal, flour, brown sugar, salt, baking powder, and baking soda. Add the buttermilk, sour cream, and eggs to the cornmeal mixture and mix well with a spatula. Fold in the pancetta and onions. Once the oven has reached the desired temperature, remove the pan from the oven. Add the remaining 3 tablespoons of butter to the pan and swirl to melt and grease the pan. Pour any excess butter into the cornmeal mixture. 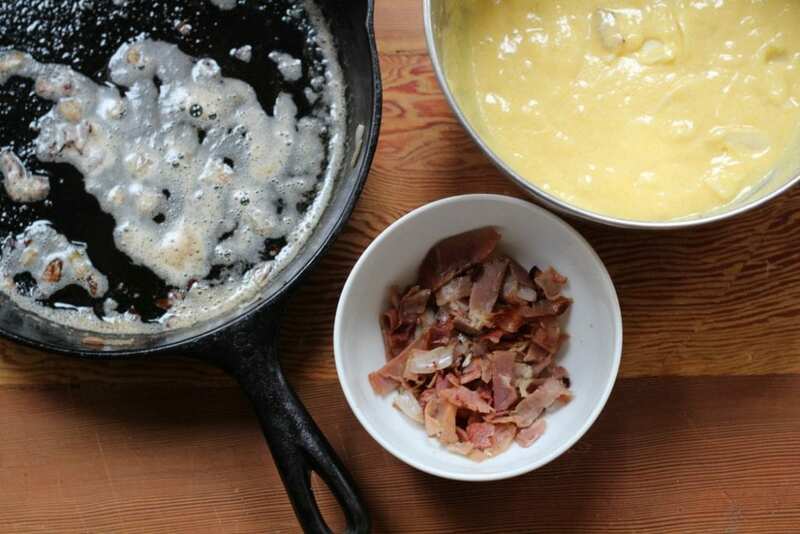 Fold the pancetta and onions into the cornmeal mixture and stir until just incorporated with a wooden spoon. Don’t overwork the batter or the cornbread will be tough. Carefully add the batter to the hot pan and smooth out the top. Bake for 20 minutes or until golden brown (check it with a toothpick in the center, it should come out clean-baking time will vary depending on the size of the pan you used). Serve warm.